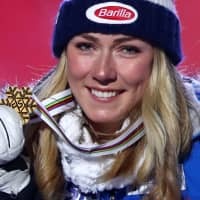 ARE, SWEDEN - During her inexorable rise to someday becoming the most successful Alpine skier in history, Mikaela Shiffrin has been shooting some admiring glances at another young female athlete excelling at her chosen sport. “In my own head, I’m thinking about what I’m going to have for lunch. I’m not thinking, ‘Oh, the face of ski racing,’ ” she said, laughing.